Whether you are evaluating existing coverage or seeking new insurance, Broadview uses a unique five-step process called Life Assurance 360™ to make certain that your policy fits your current needs and continues to serve its intended purpose for the duration of the policy. By taking a comprehensive, 360° approach to designing, implementing and managing life insurance, we believe that the outcome produced for our clients is better than when each of these steps is addressed in isolation…that the whole is indeed greater than the sum of its parts. In this step, we use our proprietary Life Assurance Design Questionnaire to educate you about your life insurance options while gathering information about your goals, preferences, and risk tolerance. Additionally, our one-page Pre-Underwriting Questionnaire helps paint a high-level picture of how your medical history may factor into the overall plan design. Prior to submitting an application, our experienced underwriting team gathers and reviews your medical information and begins clarifying all missing or incomplete details with your physicians to present your case to the carrier(s) in the most favorable light possible. For larger, more complex cases where privacy and confidentiality are paramount, our staff underwriters and licensed physician conduct a private medical evaluation to fully assess your medical risk while protecting your identity from the Medical Information Base (MIB). 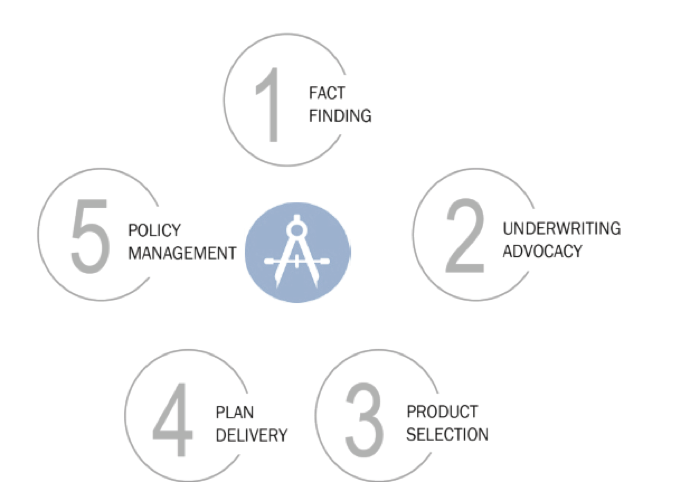 After the initial fact finding process and underwriting assessment are complete, our underwriting and marketing teams develop product recommendations based on your goals, risk tolerance, and preferences regarding the five areas of product design: safety, flexibility, equity, certainty, and premium. After product recommendations are developed, we create meaningful analyses of each plan and present the recommendations in a cogent format that empowers you to make informed decisions. After you make your choice from among the recommended plans, we initiate an on-going process that monitors and measures the performance of your plan to ensure that your benefits remain on track for the life of the policy. We regularly review the plan’s performance with you using a concise, yet thorough, policy review document.